In most cases, the cost to take the certification examination and with a passing grade be awarded a certificate is included in the tuition fee for a training course or package provided by one of our training partners. 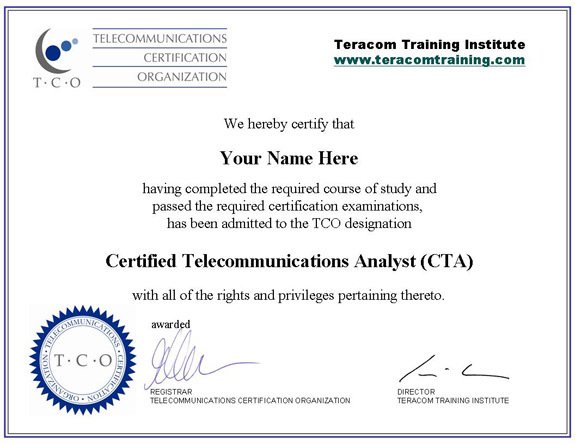 A popular choice is Teracom's Certified Telecommunications Network Specialist CTNS Certification Package. In the case of an individual wishing to be certified without taking a training course, the fee for taking the certification exam will be listed on our training partner site as "exam only". With a passing grade, the student is awarded a Certificate and all of the benefits that come with certification other than taking the courses. With Teracom Training Institute's Unlimited Plan, you may repeat courses and exams as necessary - which means guaranteed to obtain your certification at a fixed price if you are willing to learn.